When I was young, my brother and I used to receive otoshidama from family during the new year. These would be small white envelopes with cash given to children for the Japanese New Year. I can’t recall how much we used to get (my mom would always take the envelope and I wasn’t old enough to really care about money), but it was like a second birthday. Now we’re both way too old for that sort of thing (not that I would complain! ), but there are a lot of Japanese New Year traditions that I hadn’t realized were culturally specific until I was older. Like tearing down the Christmas tree and cleaning the house of all things “old” to welcome in the new (this is called susuharai). Wrapping paper, decorations, boxes and broken things all get tossed. I can’t fathom having any of the old December decorations lying about the place once Jan 1st nears, and I’m usually the first person to get it all down before a few days have past Christmas. My brother’s family does things differently since in his wife’s family it’s customary to put up the tree the day before and leave it up through January. Me, I have to get it all cleaned up because the New Year is all about starting new and fresh. Growing up we always watched NHK’s Kohaku – a multi-hour long singing contest between the genders that feature all of the top music acts of the year. It ends right at midnight with everyone signing together at the end. We don’t have NHK but my mother still tapes it for us to watch later and I never go a New Year’s eve without hearing about who’s singing on Kohaku and what silly outfits they’re wearing. But out of all of the little rituals and celebrations leading up to New Year’s, my favorite by far is the ozoni soup that tops off New Year’s breakfast. 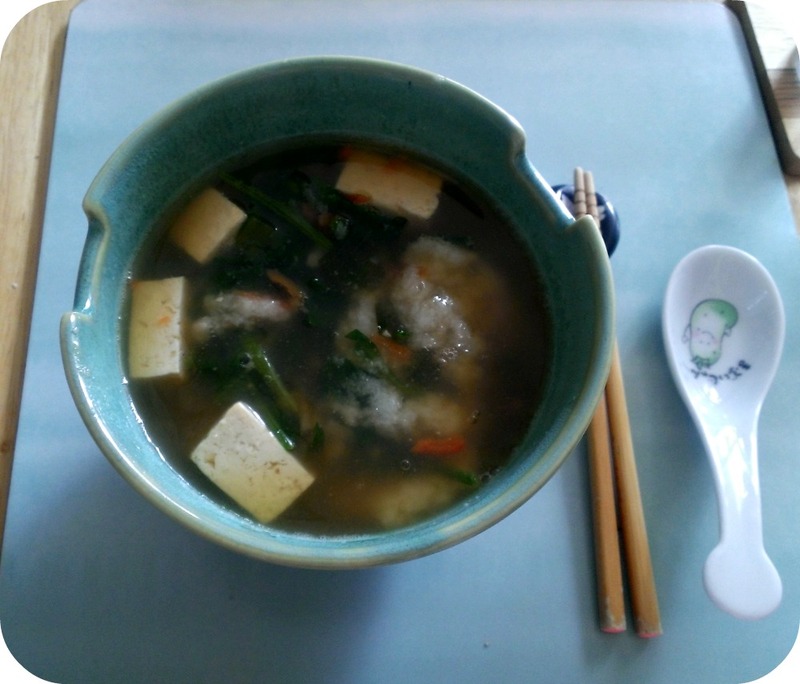 It’s a simple soup featuring gobo, carrot, spinach, tofu and mochi. This year we made 10 cups of rice into mochi using sumo. Sumo (yes, our mochi machine does have a name), did a fairly good job, but it certainly worked really hard to give us the 10 cups of mochi. I don’t think we’ll do quite so much next time since I was worried it would hurt the machine (it’s the max amount listed in the pamphlet). I think 7 or 8 cups is plenty, but my mother wanted enough mochi to feed all of us this year and so 10 cups it was! The mochi from Sumo was soft and wonderful in the ozoni. I ate three pieces of mochi and it was the perfect way to begin the new year. Apparently eating mochi brings good luck through the year and I can definitely attest to feeling like I had the best meal possible to start that good luck streak! The wonderful thing about the mochi from Sumo is that my hubby can even eat it and enjoy it. Usually he isn’t so keen on mochi in ozoni since he finds it too chewy to eat. We make fairly soft mochi by adding splashes of water as it “pounds” the mochi and he found that a lot easier to eat. However you celebrate the New Year, I hope you have had a great start to 2014! Boil 2 cups of water in a pan with dashi. Add gobo, carrot, tofu and soy sauce. Bring to a boil and cook until carrot is softened (if water evaporates down significantly, add more to make up the difference). Once close to being done (mochi is soft all the way through), add green onion and spinach and allow to wilt before serving. Categories: Recipes | Tags: japanese, Recipe, Soup | Permalink. I had been wanting to try matzo ball soup for ages. I’m not Jewish, so I haven’t had the pleasure of eating a lot of traditionally Jewish food. The idea of little fluffy balls of dough in a light soup sounded just like the sort of thing I’d like, so I bought this mix on a whim, thinking one day I’d get around to making them. That opportunity came last week when I came down with my cold. I had bought a butternut squash to make a no-chicken soup, but altered the recipe to include matzo balls. 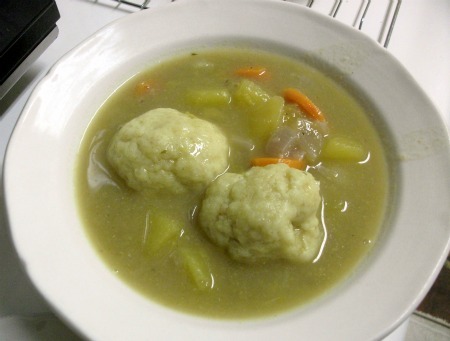 The recipe I created isn’t your traditional matzo ball soup recipe – like this one. For one, it’s vegetarian. It also has things in it like squash, a bit of evaporated milk, and oregano. Even though it deviated from the traditional recipe, this soup soothed my sore throat and settled my tummy. It was exactly the right balance of substance and broth. The hubby even liked the matzo balls and deemed the soup a good one to keep! I think I’ll put it into my repretoire of soup recipes, and I’ll definitely make it again the next time I start to feel unwell (it’s super fast and easy). 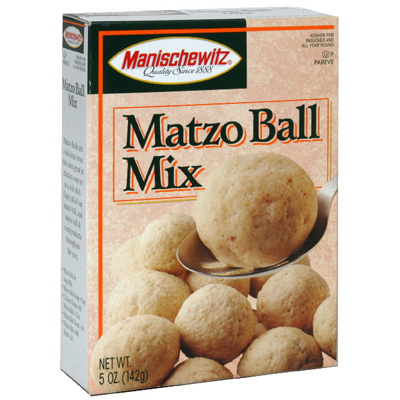 Quick review of the matzo ball mix: The box contains two packages with each packet making about 10 balls (ping pong size). The mix was easy to put together and they floated when I cooked them. The final product was a nice dumpling that was more solid than airy. It was slightly salty, but the flavor mingled with the soup after it had been stored a day, so I didn’t notice the saltiness afterward. The balls kept just fine in the soup and I was able to keep it in the fridge. Next time, I might go the parsley route, or another herb, but to be honest, I think they’re just right the way they are – especially if you’re wanting something plain. 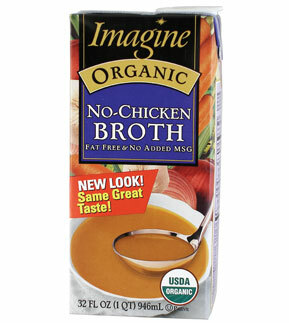 This is also the first time I’ve tried Imagine’s No-Chicken Broth. I was going to make my own version of “chicken” broth, but I didn’t want to shell out $3 for leeks. So, I opted for this instead and I’m glad I did! The broth is pretty tasty, if a bit light. It doesn’t dominate at all, so it’s perfect for something like a “chicken” soup (vegetarian, of course). The sodium content is also okay (19% dv), considering, and it isn’t all that expensive (it cost less than the leeks and it seriously cut down on my cooking time – a plus when you’re sick). I’m going to use this again for other “light” soups. Boil squash in separate pot until soft. Set aside (do not drain – you’ll be adding the squash water to the soup later). Spray soup pot with non-stick cooking spray. Turn heat to medium and add onion, carrot and celery. Cook until onions begin to go translucent. Add garlic and cook a minute longer. Stir in broth, squash, squash water, and pepper. Cook 25 minutes. Add evaporated milk and stir. While soup is cooking, make matzo balls in a separate pot (again, follow the directions of whatever recipe or box you’re using). Once balls are cooked, remove with slotted spoon and add to soup. Categories: Recipes, Review | Tags: List, Recipe, Review, Soup | Permalink. Minestrone Soup and a canned life. One change that has steadily made itself a firm fixture in our life is homemade “stock” food. By stock I mean food that one would normally (at least in our case) buy already made – canned food. We had already transitioned from canned veggies to frozen/fresh veggies so it was only a matter of time until we made the leap in other areas. My hubby thought that I’d taken this to new heights when I came up with the novel idea of making our baked beans for breakfast (a full English breakfast featuring eggs, beans, bacon, sausage, tomatoes, fries/hash, and mushrooms). “Why can’t I find a recipe for baked beans!? How hard could it be?” My frustration was met with a moment of silence. “Who wants to make baked beans when you can buy them?” countered my astute husband. He made a point that many seemed to have agreed upon. There were many recipes for Boston Baked Beans and other yummy American versions, but as anyone who has had a can of Heinz Baked Beans knows, the Boston bean has no place on the English breakfast plate. Apparently the humble British Baked Bean wasn’t gourmet enough for a recipe. I was finally able to dig up a recipe that I had to tweak (I’ll feature that on here when I have to make it again in a few weeks). All of this wouldn’t have happened if it were not for my trusty Kroger Vegetarian baked beans upping their sugar levels. When you eat these beans at least once a week, you notice these things. (or some version of it). This, by the way, is the LAST can that I’ll willingly buy of the stuff. 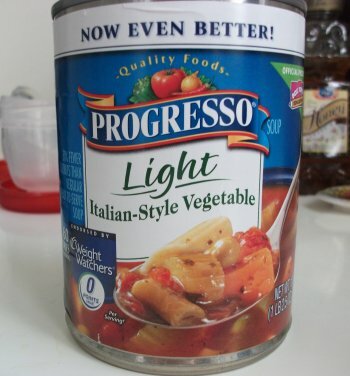 It had been about a year or so since the last can of Progresso, so my memory of it was based on my taste-buds’ reactions to it at the time: a bit tomato-y, chunky, and an overall decent can of soup given its nature. I’m a big believer in the idea that if you are exposed to something long enough, you will think of it as normal. Canned food is one of those things. Canned beans, tomatoes, and soups are as ubiquitous as canned vegetables – we eat them because they’re easy and, well, that’s what you do. You eat canned veggies in recipes and call that “from scratch.” Once you break that chain your taste-buds adapt to the “cleaner” taste of food and you never go back. Or, at least if you do, you’ll wonder what possessed you to pick up that can in the first place. My hubby isn’t a big soup eater, in general. There are certain types of soups that he likes and I’ve learned which ones are probably going to be a hit. One soup that he definitely likes is minestrone. 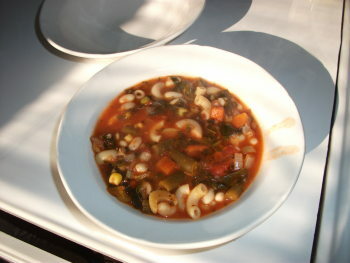 When I first started fiddling with the idea of making my own soup, I opted for “Best Darn Minestrone Soup Around” recipe on AllRecipes.com. It sounded good and it had great reviews. I scaled it down and fixed it and it really was good. What I didn’t like about it was the amount of fat and dairy involved (when a recipe calls for 4 cups of heavy cream, a shiver runs up my spine). So I tweaked. A lot. In fact, it hardly looks like the same recipe, but I do have to give credit to the original recipe since it did give me inspiration. This recipe feeds two people about 6 times (and it freezes really well). 1 Can of diced tomatoes with juice. 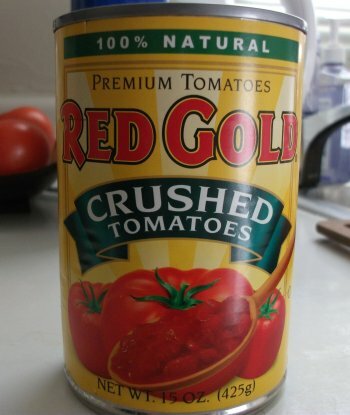 I bought this thinking that it was actually going to be a can of crushed tomatoes (like in the picture – I really should have known better). Instead, it was more tomato sauce with bits. I fretted that this would make the soup too tomato-y (something the hubby hates), but it didn’t. 1 teaspoon (or tablespoon depending on your likes) crushed garlic. 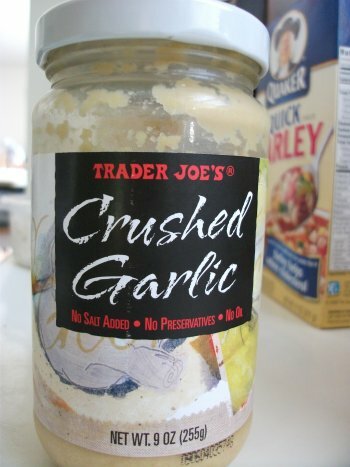 I love this stuff from Trader Joe’s. Chop onion, carrot, and celery. Add to pan (either with some butter or use non-stick spray). Cook until just tender. Add garlic, pepper, Better than Bouillon, mixed vegetables, and tomatoes. Bring to boil and let simmer. While soup is simmering, cook prepared beans in small pan. When beans are just tender, add to soup. 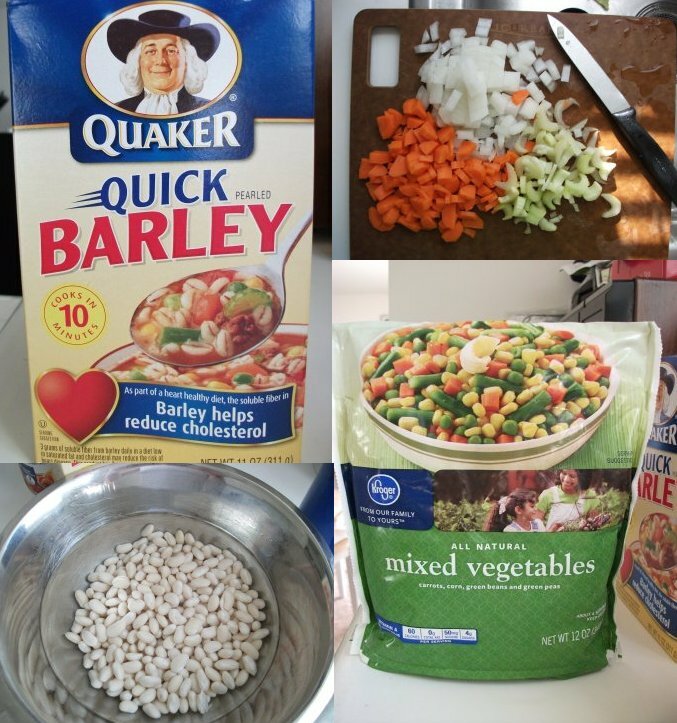 Cook barley and add to soup. Continue simmering. This is what it looks like at this stage. Add basil, parsley, turnip greens, and spinach and cook until everything is tender. Generally the entire simmering time takes a couple of hours in total (from the first simmer to this step). Serve! See how chunky and lovely? Gosh, this stuff is good! 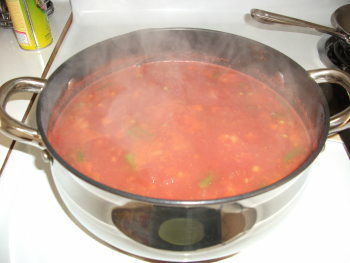 Categories: Recipes | Tags: Recipe, Soup | Permalink.